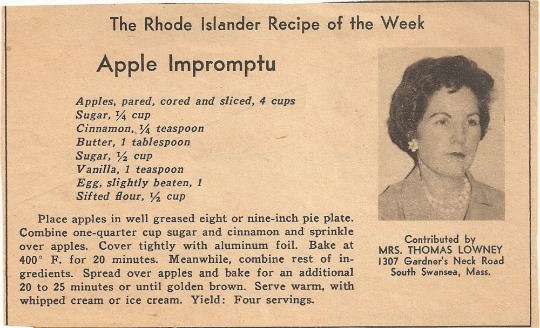 I’ll be visiting Massachusetts and Rhode Island at the end of this week so it’s timely to publish this Apple Impromptu vintage recipe as printed in The Rhode Islander. Although I’m uncertain of the exact publish date, I would assume from the pearls that this apple recipe is from around the 1950s. Apple impromptu is like an apple cobbler but with a much fancier name. Apples are sliced and covered with a sugar mix, then baked. During the last 20 minutes, a batter is applied to the top. A sweet mix of cinnamon, sugar, and in-season apples make this a quick and easy dessert recipe. Last year, we picked a lot of apples from a local orchard but in retrospect I did not make enough desserts (I canned plenty of applesauce though). This year, I plan to make apple crisp and this apple pie cake. Place apples into a well-greased 8-9″ pie plate. Mix 1/4 cup sugar with cinnamon, then sprinkle over apples. Cover pie plate with tin foil, then bake at 400F for 20 minutes. Meanwhile, mix remaining ingredients. Spread evenly over apples and bake uncovered for an additional 20-25 minutes or until golden brown. Serve warm with whipped cream or ice cream. Makes four servings.